Luang Por Prom was born in Ayutayah Province on 20th April BE2427. He was ordained as monk at Wat Pahk Kong Yang on 15th April BE2447 at the age of 20 years old. Before Luang Por Prom was ordained as a monk, he already learned magical chant from Ah Jahn Puang. After he became a monk, Ah Jahn Puang brought Luang Por Prom to learn Dhamma under Luang Por Dum. After 4 years, Luang Por Prom went to become the disciple of Ah Jahn Poowon. Ah Jahn Poowon taught all the magical chants that he knows to Luang Por Prom. After Ah Jahn Poowon passed away, Luang Por Prom stopped learning from any teachers. The 3 teachers that Luang Por Prom has learned from, were the best teachers during that time. The first teacher, Ah Jahn Puang was the disciple of Luang Poo Mah Wat Bahng Muang; who is also the teacher of Prajow Taksin Maharaht (King of Thailand before Rattanakosin period). As for Ah Jahn Poowon, he was the disciple of Luang Poo Nin of Wat Keow Pah Sak. 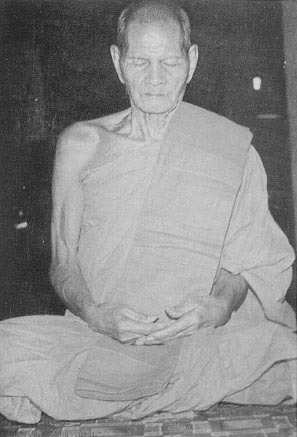 Luang Poo Nin was the brother of Luang Poo Saeng, who was the teacher of Pra Somdej Praputjahn Dtoh. Luang Por Prom went forest dwelling(Tudong) at BE2457. He tudong around the Chong Kae mountains in Nakon Sawan Province. When he first arrived at foothill in Chong Kae, there was a heavy thunderstorm. The villagers asked him to shelter inside a cave. The first night when Luang Por Prom was staying in the cave, he fell asleep after the long journey. Luang Por dreamed of a human image in his dream; guiding him how to follow the path of Buddha's teachings. Luang Por Prom decided stay in that cave as his dwelling place, because on the first night he had already have such a dream. Luang Por Prom quickly returned to Ayutayah Province to sell off all his farmland, which was passed down by his parents. In BE2458, Luang Por Prom went back to Chong Kae village. With the help of the villagers and the money he has, he built a temple which was named as Wat Chong Kae. Luang Por Prom stayed in Wat Chong Kae for 60 years, until he passed away on 30th January BE2518 at the age 96 years old and as a monk for 71 years. Luang Por Prom's body is housed in a glass coffin in Wat Chong Kae. His body remains in good condition, and there are no sign of decay. In fact, his finger nails and body hair still growing, as if Luang Por Prom just fell asleep and not passed away. Some people said that, this is the level of Arahang, where the body will never be decayed.